Shadows is a collaborative piece which combines visuals with sound and poetry. The idea is based on old autograph albums, which were kept by a stewardess who worked on the transatlantic liners in the 1930’s, signatures – marks left by people who travelled back and forth between Southampton and New York – the famous and the unknown. About Shadows: The source was an earlier and entirely visual book. 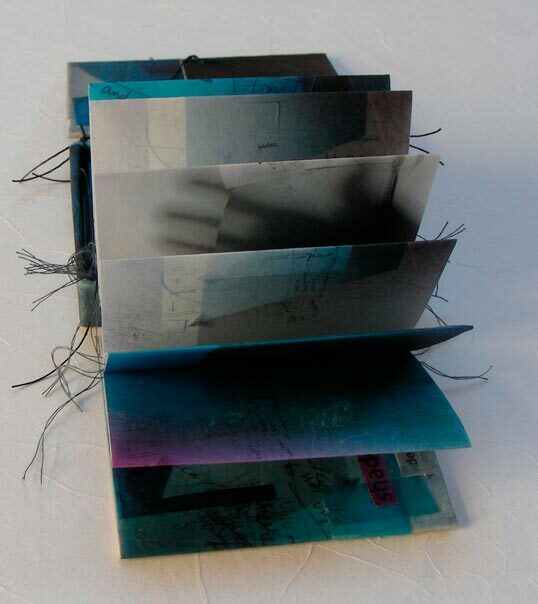 Each page in ‘Book of Shadows’ was a digital composition of dozens of layers, which I de-constructed into the separate layers, then placed them on separate timelines in ‘Multi-media, Director’, This allowed each to appear, fade, recur. In the production, sea, shadow and signs constantly shift – while interweaving through layers of time and space are the signatures – relics from a hidden past, and of the shadowy figures who left only their marks behind in the autograph books.